After an eventful year on the charts and on the road, GRAMMY-Award winning Zac Brown Band has proven that "overnight success" can be years in the making. New fans drawn by the irresistible hit singles, the awe-inspiring musicianship and dynamic live shows might have thought the Zac Brown Band emerged from nowhere. In fact, the band has paid its dues for years and put in its time for just this moment. It may have happened quickly, but it's definitely built to last. 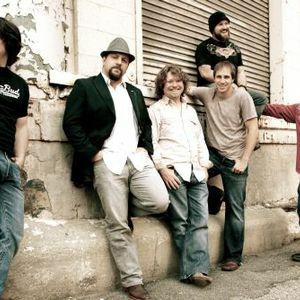 Zac Brown Band's second major label studio album 'You Get What You Give' (Atlantic/Southern Ground Artists, Inc.) was released on September 21st, 2010 and debuted at #1 on the Billboard 200 chart. The album features guest appearances by Alan Jackson and Jimmy Buffett and as Zac explained to Associated Press, "It's a defining record...Every step of it's done the right way and I expect people are really going to love this record and see the depth of our musicianship, we're always growing. Not that we've arrived at any grand finale or anything, but the progress from this last record to this one, it's tremendous and I'm proud of it." On the eve of the release from the famed Red Rocks Amphitheatre, Zac Brown Band streamed their live show - dubbed "Best. Concert. Ever." (Cleveland Plain Dealer) - to fans everywhere via ZacBrownBand.com powered by Ustream. Touting nearly a half-million live views, the concert was among the most-viewed on Ustream. The band also recently earned four GRAMMY nominations including "Best Country Album" for 'You Get What You Give' and five CMA Awards nominations including "Entertainer of the Year." Previous honors and accolades include their 2010 GRAMMY win for "Best New Artist," 2010 CMA win for "Best New Artist," 2009 Academy of Country Music Awards win for "Top New Vocal Group" and the 2009 "Breakthrough Video of the Year" from CMT and USA Weekend for "Chicken Fried." No question, the past year has been dizzying for the hardworking act. The band's first major label release, 'The Foundation' was one of Billboard's Top 20 albums of 2009, and was the first major label debut album in 18 years to yield five No. 1s including "Chicken Fried" and "Free." Released on November 18, 2008 on Atlantic Records, 'The Foundation' debuted at #17 on the Billboard Top 200 Chart and #3 on the Top Country Albums Chart. It's now certified double platinum by the RIAA, which Brown says, "solidifies an achievement that has been more than a decade in the making." "There's no way to predict how fast everything is going to come together," adds the down-to-earth Georgian. "Or that it took 13 years to get to the beginning of it." In 2009 and 2010 Zac Brown Band successfully headlined the Breaking Ground Tour. "For us to come into our own, we had to make it happen as a headliner," notes the Dahlonega, Ga.-raised Brown. There's no question that the road-tested band had the chops to pull it off. In addition to bassist John Hopkins, violinist Jimmy De Martini, guitarist/organist Coy Bowles and drummer Chris Fryar, this year the band has added multi-instrumentalist and songwriter Clay Cook, well respected as a musician's musician and an MVP-caliber performer on the Georgia music scene. Cook, perhaps best known for his co-writes with Grammy-winner (and former Lo-Fi Masters bandmate) John Mayer, rounds out the ZBB sound on guitar, vocals, organ, mandolin and pedal steel. "We've got a great following," Brown affirms. And while the band strongly identifies with country music and country radio and, of course, continues to have great success there, it's not an easily pigeonholed crowd; while loyal country fans show up in droves, the band also appeals to lovers of bluegrass, jam bands, reggae and seemingly everyone in between. It's no wonder that another famous genre-hopper, Michigan's Kid Rock, has performed with the band and given them his strong endorsement. Zac Brown Band also shared the bill for several Dave Matthews Band dates on their summer 2010 stadium tour, including NYC's Citi Field and will make their Meadowlands debut as well as several stadium stops across the country in 2011 as part of Kenny Chesney's "Goin' Coastal Tour" starring Kenny Chesney and Zac Brown Band. In fact, the Zac Brown Band's rehearsal space provides strong clues that the unit puts no artificial limits on itself. While one wall sports a whiteboard chock full of upcoming coast-to-coast tour dates, the other is graffitied with hundreds of song titles-sharing space on a wall that also includes a Bob Marley banner and a framed portrait of Willie Nelson and Waylon Jennings. "Everything has to do with the song," Brown observes. "Every song is born and wants to go its own direction. When audiences hear a new song for the first time, if at the end of it they're going crazy and cheering, you know you've pulled it off." Brown launched his Southern Ground Artists, Inc. record label in 2009 and signed Atlanta-based artists Sonia Leigh, Levi Lowrey and Nic Cowan. In addition to the music, Brown has also launched a line of steak rubs and barbecue sauces under the Southern Ground label, and in collaboration with photographer Jeffrey Skillings and writer/bandmate Coy Bowles, released his first cookbook 'Southern Ground' in 2010. As Brown notes, these projects have their roots in Zac's Place, a lakeside restaurant he used to co-own and run. "For me it's about creating something that's really excellent," he says. "People are going to be blown away by how good the products are." As if all this weren't enough, Brown is developing a charitable foundation to run a children's camp, which recently began clearing land for its planned site. Despite all the irons in the fire, Brown nonetheless calls his foundation and camp plans his "life's work." "Having the camp and giving back is important for me," he says. "I'm very blessed to have what I have, and I know a lot of that's on credit for what I do down the road. It's very important for me to keep that in mind. I want to leave something behind that does some good after I'm gone." And while audiences party, they'll be doing well to keep up with the musicians onstage. "We laugh all the time," Brown notes. "You're either sleeping or up laughing and having a good time. Or we're playing music. It's better than I could have dreamed of."